One of many lessons I’ve learned or have been reminded of 9 days post-op is that I can’t predict the future. I can plan for, anticipate, and make educated guesses, but often what I expect and what actually happens are two different things. WAY different in some cases. But one thing – the love of a good friend – turned out exactly the way I expected. What I expected: I’d be doomed to weeks of sponge baths and washing my hair in the kitchen sink. What actually happened: I was allowed to shower five days after surgery. What I expected: To be wrapped in swaths of gauze for a month, and only a professional could change what I was sure would be bloody bandages. What actually happened: Two days after surgery, my doctor cut off the ace bandage, and underneath was simply a long thin bandage covering the incision. I changed the bandage two more times when I got home, but have been dressing-free since Monday. What I expected: For my incision to match the beaut of a scar on the other knee. What actually happened: Surgical glue. As of this morning, more than half of the wound is completely healed over. What I expected: To experience some pain the first few days, but to be driving around in a Wal-Mart cart within a week. What actually happened: 9 days later I still can’t stand for longer than 10 minutes, and I have no desire to go anywhere. While I’m dealing with the pain and exhaustion, the degree to which I feel both surprised me. Like my daughter said the other day, “How do people in their 80s and 90s recover if someone like you is huffing and puffing just going back and forth to the bathroom?” Good question. What I expected: To live in shorts and t-shirts and be completely unfettered from snaps, buttons, hooks and ties. What actually happened: The weather turned chilly (although 90 is forecast for Sunday, thank goodness), so I was back to long sleeves, sweatshirts, and sweats. I also feel lost without a bra. So much for unfettered. What I expected: To take a break from makeup. What actually happened: No one other than my husband, daughter and in-home nurse and physical therapist have seen me, but feeling my best emotionally is helping me feel better physically. Makeup is a non-toxic, feel-good drug. What actually happened: Much sobbing and swearing. If you EVER have knee surgery, do NOT ignore the advice, “You might want to take your pain meds an hour before PT.” In fact, you might want to take a little extra. Holy. Cow. I’m not kidding. What I expected (or actually, in this case, what I didn’t realize): All bodily functions would return to normal once I got home. What actually happened: I’ve taken enough Dulcolax and Milk of Magnesia to keep an entire nursing home regular for a month. What I expected: Lots of time to watch movies and read books. What actually happened: I’ve watched a few movies and have started one book, but much of my time is spent getting from my bed to the bathroom, my bed to the kitchen, my bed to the porch…I also do a lot of staring into space. Oxycodone. Yuck. What I expected: To heal up in a few weeks and have my doctor evaluate my right knee for possible debridment or total knee replacement before the birth of my third grandbaby in February. What (will) actually happen: NO WAY! I’m very glad I didn’t know how much this left knee debridement would hurt because I probably wouldn’t have done it even though I really needed it. However, I’ll need time – several months if not a few years – before I can do this again. My right knee is hanging in there better than I thought it would, as are my shoulders and wrists. Once I’m healed up (which, I’ve accepted, may take three months), I’ll concentrate on getting my entire body back into its pre-surgical shape. There will be no talk of cutting Lynnie open again anytime soon. I’ve received and am humbled by the generous support from my family, friends and neighbors, but there is one person who keeps me the most centered. My friend of 42 years, Teela. 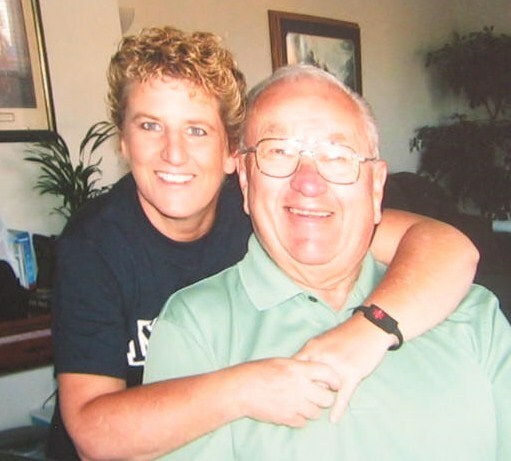 I keep Teela’s photo tacked to the corkboard next to my bed to remind me what real courage is (here she is with her fabulous father, Hub, who when I was a kid I called my “daddy boyfriend”). In the last year, she’s had a mastectomy, hysterectomy, two other surgeries, countless radiation and chemo treatments, and a close call with liver cancer (which, thank god, turned out to be nothing more than a shadow on a film). Teela knows all about pain and fear. She also knows about living. Teela’s always been a glass-half-full, vivacious person. 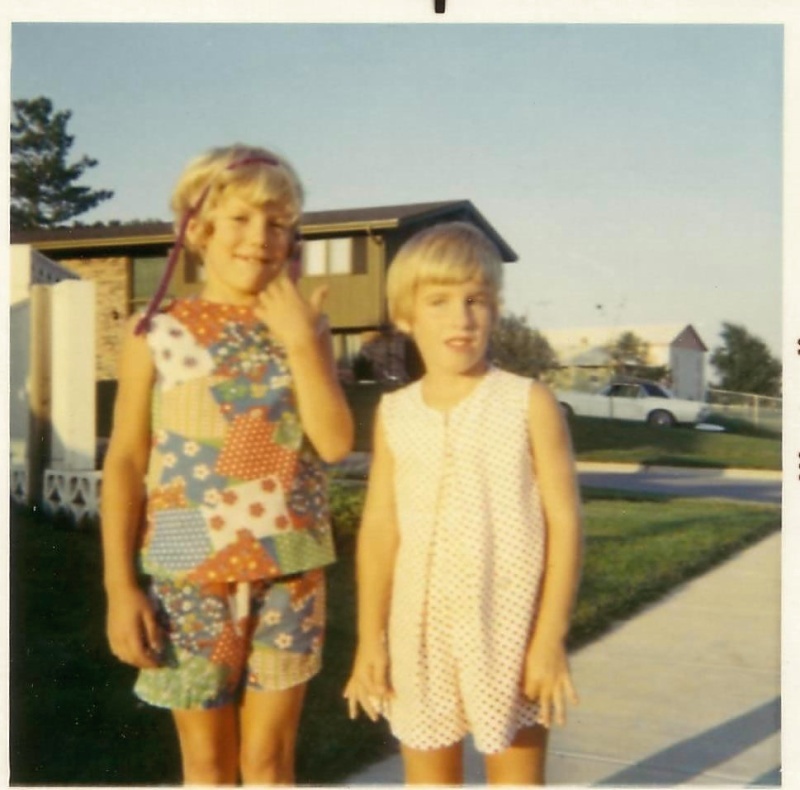 She called me out of my shell many times when we were kids, and in many ways we’ve lived parallel lives. Love lives, anyway. It took her a few husbands before she found the right one, just like me, and we were pregnant at the same time. Just as I expected, Teela’s been with me (via the Internet) during my decision to have surgery and in these days afterwards, motivating me with every capped word and exclamation point and hilarious “Do you remember?” moments from our past. Here are a few photos of Teela and me from a long time ago. In many ways we’re still those little girls. Just what I expected and what actually happened. 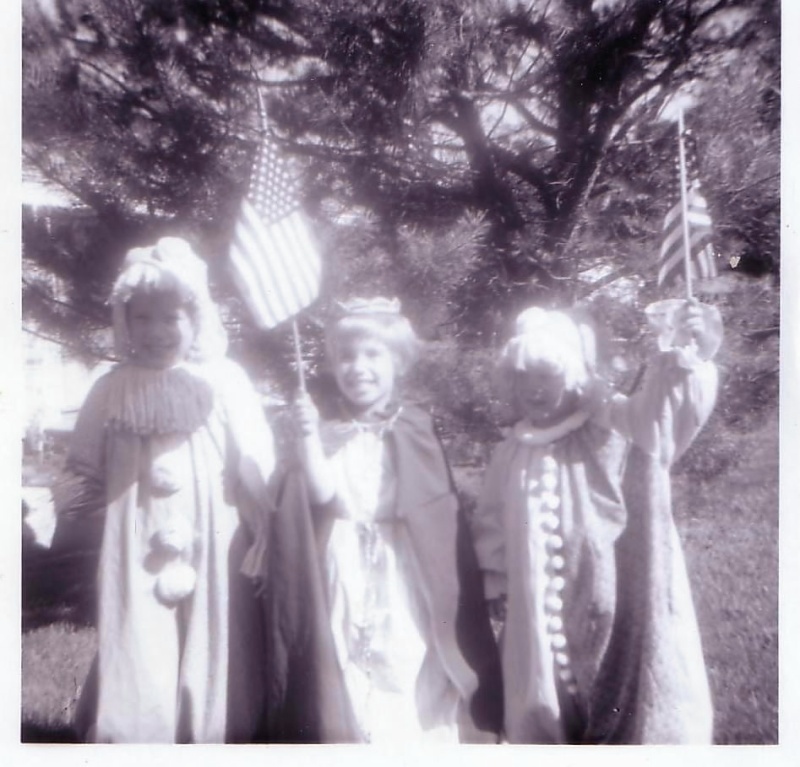 Taken at our neighborhood 4th of July parade in 1970. Me, Teela, and my brother Matthew. I know many of you who use Firefox are unable to leave comments on my new-themed site. Please feel free to email me at lynnbering@verizon.net until I figure out exactly what I or Blogger are doing wrong. Thank you! This entry was posted in Uncategorized on July 2, 2010 by Lynn Haraldson. Loved this post, Lynn, because it reflects real life. At age 63, I often think about “What I Expected VS What Actually Happened.” Sometimes life is better, sometimes worse, but rarely exactly what I expected. Continued wishes for your recovery. Glad you're doink ok Lynn even if it's not how you expected things to go, still sounds like you're hanging in there. Glad you got Teela to give you a boost too and make you realize it could be worse. Great story about you two, made me think of my best friend of the past 34 yrs. A few more weeks and you'll be looking back thankful it's all over. How lucky you are to have someone in your life who has been a friend for so long. Sorry that your recovery has had painful and exhausting moments. Sometimes it's better to not know how rough something is going to be. If we knew, we probably wouldn't do some things we need to do. My hope for you is all this is worth it and you will be better afterward. Anyway, I think you're brave to do it. I need to do something similar with one of my knees, but I keep putting it off. Excess weight takes a toll on knees–I know from experience. Lynn, I am an almost 49 yo mom who had a knee replacement a year ago. I think a total replacement is probably much easier than what you are going through. I was on Percocet for about 2 weeks but I can't take NSAIDS so my pain med options are somewhat limited. By 9 days, I was walking with a cane and driving. I went back to school 3 weeks after surgery and got along fine – a little slow and I needed a chair to prop my leg on but it was really no bit deal. The therapy was rough but it didn't last long. It did take about a year to get to my pre-op strength in that leg, but, unlike you, I don't exercise faithfully. If you need a total replacement, don't be afraid – GO FOR IT! Hi Lynn! IE ate my comment. 😦 Trying again…Sorry to hear that the recovery is going slowly and that you're in pain. I've been thinking of you lately and wishing you well, guess I need to wish a little harder! I'm glad that you have your daughter and husband to help you at home, and that you have your friend Teela to help in your heart. I swear I had an outfit made out of that same patchwork material…you sure can tell the era we are from! 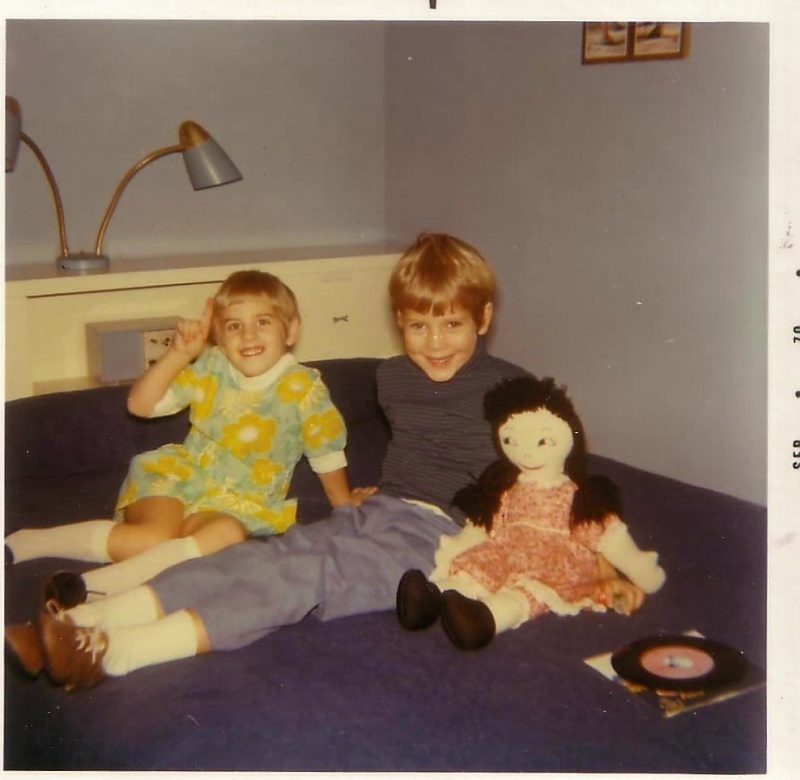 Love the pic of you and Teela on the bed with the doll and 45 record – best of both worlds! Good friends are priceless – so glad she's been with you…isn't the internet wonderful? Interesting how things didn't go exactly as you thought…some better, some worse. That oxy is such a blessing and a curse – hopefully you won't be needing it soon. You seem to be doing really well considering the traumatic nature of the surgery. I hear you when you say NO WAY to more…I hope you will be able to hold off for years. Take care and hang in there! Not sure I've ever posted here, but I do read. Guess this is a delurking? I didn't know for sure what surgery you were having, but if I did, I wish we could have talked. I'm an orthopedic nurse and have a LOT of experience with knee surgery patients. sounds like you are on track with most other knee surgery patients at this point. Vague staring in to space alternating with severe pain..yep that's about it. My #1 nurse educational comment is: Take the pain meds, do not try to wean off the pain meds, take the frigging pain meds till you don't need to. #2 eat fruit/bran/trees/baskets/ drink more water than ever because if you are eating a lot of fiber and not drinking enough water than you are making it all worse…Miralax is supposed to be the best laxative out there…#3 Ice the knees after therapy. this is exactly why people need to have all 4 wisdom teeth removed at once – would never go back for the second two otherwise. But realize NO one can/should/will get both knees done – one is definitely enough. But coming out the otherside – it will be worth it. Hi, Lynn. I haven't posted many comments lately – but wanted to let you know I've been following your recovery and am wishing you peace. Sounds like you're living the pluses and minuses right now but on your way to healing! Loved the post, had to giggle now and again. This is a post to bookmark. If I'm ever facing surgery or cancer, I'll need it. And what a good format… what I expected vs. what actually happened. The exception, your friend Teela, is precious indeed! Hope your continued recovery goes well and that the pain in therapy subsides soon. Oxyco-whatever is the pits and addictive (as I well know because my husband's been on it for 4 years now).